I notice Toothill & Westlea Councillor Steve Wakefield has recently blogged ‘A Crumb Of Comfort’ in which he likens Swindon Borough Council to a ‘malnourished body’ which is forced to hoover up every last crumb of cash to make ends meet. But hoovering up cash wherever they can find it is normal behaviour for members of Rod Bluh’s cabinet, and it is often done to the deliberate detriment of his own back-bench councillors. Charley Morgan of the Swindon Pravdatiser this week reported that Swindon play parks scheduled for regeneration with cash from the Governments ‘Playbuilder’ grant would, according to Deputy leader of Swindon Council, Coun Garry Perkins, “be ‘protected”. Charley’s article come hot on the heels of rumours escaping the Civic offices that many, if not all, of the ‘playbuilder’ team have already been ‘Rodicalised’. In other words, Rod Bluh has decided that although a large chunk of the original £2,000,000 playbuilder grant remains unspent, the expertise of those workers entrusted with seeing the play park regeneration through to completion is no longer required. Is Rod intending to turn the play park regeneration into yet another pRodject, just as he did with the Central Library and former Railway museum?, both of which suffered significant ‘problems’ as he imposed his own vision on them detrimentally. It is not for nothing that Rod Bluh is, in some professional circles, quietly referred to as the ‘Eastcott Cuckoo’. …or using the money for a different pRodject entirely? It would be nice to think that Councillor Garry would hold himself to his word unsupervised, but his words are already thick with political grease and past events in Stratton might suggest to many that the parents of Penhill, Highworth, Wroughton and Rodbourne ought to watch Rod Bluh and Garry Perkins very carefully if they want to see their children playing in safe, modern playparks in the near future. 2008 last the last election year in Swindons cycle of ‘thirds’. There had been location elections in 2006 and 2007, so after the 2008 elections were concluded there would be no further elections to the council until this year, 2010. 2008 was therefore seen as an important year in which the Conservative group could consolidate recent gains and dig themselves in ready for the local and general elections in 2010. In the run up to the 2008 elections Councillor Bluh and his chums didn’t want any boat-rocking or bad press, so a lot of promises were made before the elections, (to keep people sweet and ‘on message’), which weren’t kept after them. One such promise concerned the playing fields at the former Headlands School in Stratton - it would be ‘kept free of houses’. It should also be noted that Councillor Bluh was also standing for re-election in 2008 and I would describe him, at that point, as having a very firm desire to avoid bad news stories. Stratton Councillors David Sammells and Paul Findlow, (both Conservatives), were assured by Bluh’s cabinet that the playing fields were ‘safe’ and a Conservative newsletter was subsequently distributed to every house in the ward proudly proclaiming that the safety of the playing fields had been ‘secured’ by the Conservative Councillors. Unfortunately for Councillors Sammells and Findlow, and worse for the children and parents of Stratton, it would later prove to be untrue. With the 2008 election safely over for Rod Bluh and the Conservative group it wasn’t long before a bad smell wafted out of the civic offices which was soon followed by a bad tempered Councillor Sammells. He did his very best to hide it, but eventually the story broke and the reason for Councillor Sammells’ ire became crystal clear when it the Pravdatiser published the story in mid-September. The headline was: Tories under fire over playing fields. POLITICAL rivals have slammed Conservative politicians who promised to keep green space at the former Headlands School free of houses. Under new plans, the playing fields beside the school, now the Swindon Academy, would be covered in 200 homes but a Conservative newsletter published last year claimed the playing fields had been secured. 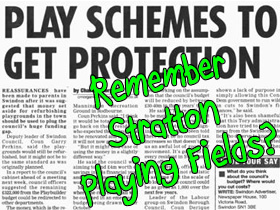 And who took the decision to sell Strattons Playing fields off to developers? I’m told it was none other than Councillor Perkins who was, at that point, the lead member for Childrens services. I don’t know who broke the news to Councillors Sammells and Findlow that the playing fields weren’t as secure as promised, but wouldn’t be at all surprised to learn that it was Cllr Perkins again. I spoke to David Sammells shortly before he stepped down from his council seat and I formed the lasting impression that he felt personally let down, betrayed even, and that he was genuinely aggrieved for his ward residents. I expect Cllr Dave rues the day he trusted the cabinet and, if he ever finds himself in a similar situation, will be wary where money and land are involved and will place a metaphorical breadboard between his shoulder blades. What’s the moral of this tale?, readers must form their own opinion but mine is; left unsupervised within easy reach of a pot of available cash Rod Bluh and his chums are likely to siphon it off into something they think is more ‘worthwhile’ than children’s play parks. A recent example of a government grant being used for something other than its intended purpose in Swindon was when the 2009 government LABGI grant, (Local Authority Business Growth Initiative), was used to pay off the massive debts incurred by staging Radio Rod’s Big Spend Weekend, the Radio One Big Weekend. Rod Bluh grudgingly admits to forking out £498,000 of public money to pay for the 2 day knees-up, but clams up petulently when pushed for the real, much higher figure. Bluh promises me a ‘written answer’ to that very question when I asked him directly at full council. His promise has yet to be honoured but I’m a patient man. I’ll wait years if necessary. Do I think the playparks will be regenerated? the simple answer is no, at least not for a very long time. The playbuilder workers have been fired whilst the grant money is still available so I don’t believe Bluh & Co have any intention whatsoever of doing it soon, if at all, with the remains of the playbuilder grant. In summary I think the playbuilder grant will, (if it hasn’t already), be hoovered up with quite a few other pots of cash to go into Bluh’s £4,000,000 budget black hole which, if not plugged quickly, looks likely to expand into a much larger problem for us, the tax payers and service users of the Borough.